PUBG Corp has sent over some interesting stats pertaining to PlayerUnknown’s Battlegrounds. Since release, the game broke all of Steam’s concurrent player records, and has also sold over 26 million copies across PC and Xbox One. 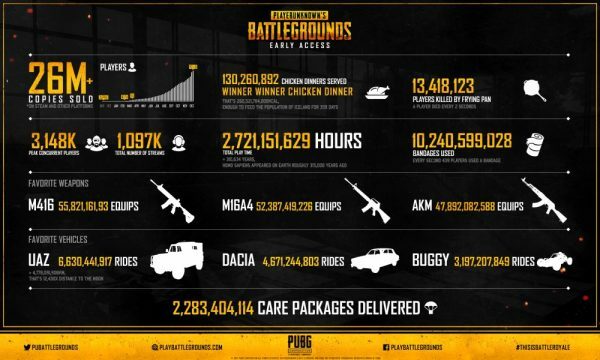 According to the infographic posted by PUBG Corp, players have spent over 2.7 billion hours in-game, served over 130 million chicken dinners, and can boast a whopping 3.15 million concurrent players. The M416 is the current weapon of choice with players, and the UAZ is the favorite mode of transportation. There have also been around 2.3 billion care packages delivered. Not to mention PUBG ended the year with a hefty $712 million in revenue, according to SuperData. Consoles players interested in the game can join up with the rest if they like by grabbing the new Xbox One S bundle featuring PlayerUnknowns Battlegrounds. That is, if they don’t already own an Xbox One console. Since it’s release on Xbox One, PlayerUnknown’s Battlegrounds has surpassed 4 million players across Xbox One systems, and now Microsoft is celebrating by offering a new bundle. The Xbox One S PUBG Bundle will be available for $299.99 at participating retailers worldwide, or the regional equivalent, and is available for pre-order today.